The Finnish Nightmares -cartoons are very famous and funny for a reason: they are so true! Finnish people in general want a lot of “own space”. They usually don’t even say “hi” to strangers in the hallway. I think they don’t want to be rude but it’s just a matter of being shy and as long as we don’t have that small-talk culture, we don’t know what to say. It can also be hard with the closest friends or family to tell about our real feelings. Personally I’d love that culture to change a bit in the fact that it would be easier to tell each other about what’s bothering us or how we feel. The famous Finnish “sisu”, which means strength and not giving up, is a great thing so that Finns really want to cope with their lives and make their dreams come true. But I wish that Finnish people could also tell a little earlier, if they need help with something, instead of keeping their problems as secrets inside. Some foreign friends of mine told me that it’s a little more difficult to get to talk with Finns but once you do, it’s a chance to make up a good, reliable friendship. In general Finland is also told to be a very safe country. Wow, here comes the sun! After a long, long winter the summer is like a dream! The sun is up also during the night and people enjoy that in many different ways: there are a lot of festivals and outdoor restaurants. In that picture in the middle, there’s a sauna that is floating on the water like a boat. Sauna is an important thing all over year – it’s a place to relax and actually talk about everything. TOP three things about finnishness; why I love Finland. Usually people thinks that Finland are cold place to live and we are not so social people as people of the other cultures. However, Finland and Finns are far more than what these people think. So now I’ll tell you three reasons why you should fall in love with Finland. The Finnish nature is so beautiful. We have a lot of lakes and forests. The richness of Finland’s natural beauty is four different seasons. Seasons brings different colors to Finnish nature, for example, in winter the natural color is white. Finland’s nature offers many different opportunities for sports. For example, I love jogging and cycling on various terrains. When I walk in the woods I can listen to the sounds of nature and forget about the sorrows and relax in that moment. Doesn’t it look so pretty? We Finns love to visit the cottage, especially during summer time. We usually have our own cottage or we can rent them for certain times. Cottages are often located near to the lake or sea and usually we go there by motorboats or by car. In the cottage we spend quality time with family or friends and the most important thing is to relax. I personally think that the best things in cottage life is to relax and enjoying other people’s company, especially with loved ones, and of course swimming in the lake or sea. When we are in the cottage, we also love eating, playing and go to the sauna. I’ll tell you later more about the sauna. Addin to the cabin, I love to watch the sunset. Sauna is the most finnish traditional thing. Most Finnish love to go sauna. If you have never heard of what is the sauna, I’ll tell you about it. It is basically a room which is heated very warm, by throwing water to hot stones that are in the sauna stove. Sauna is usually connected to cottage life, so it’s important to have a sauna in our cottages. We usually go straight to swim from sauna. After swimming, you can go back to the sauna in to warm up again. Adding to the sauna, many people has a sauna in their everyday home. When I go to the sauna, I just love the feeling that I get from it and relax on the benches. What is an effective way to combine people to form a culture? It is a language. In our case unique, rare and a strange-sounding language. Finnish has only more or less 5 million speakers in Finland and minorities in Sweden, Norway, Russia, Estonia and even in the USA, Canada and Brazil according to Wikipedia (Wikipedia. 2017. Finnish language). Languages evolve constantly. New words are invented with modern needs. Other words are getting out of fashion and forgotten. Finnish is a young language comparing to any bigger country and their linguistic heritage. We have our ”100-year independency birthday” coming up this year which amazes people from old countries like Spain, China or Iran. We are a young nation. The first document of a pre-Finnish language, Finnic is a birch bark letter no. 292 from the beginning of 13th century (Endangered languages. 2017). Whereas the earliest examples of Chinese language are divionary inscriptions on oracle bones from around 1250 BCE and Chinese culture is one of the oldest in the world (Wikipedia. 2017). Their country and culture can be traced back thousands of years. You can only imagine which culture has more history included in their heritage and words describing their historical culture. Does Finnish have different names for its historical eras while Chinese people name different eras according to their rulers? Well, sometimes in the spoken language we may speak about “the times when Kekkonen was the president”, but nothing like long eras like the Chinese have. Short history could be considered as a factor built in our national identity. We don’t have as many national tales of legendary deeds or heroes to pass on to our generations. We have Kalevala, but it isn’t considered as a children’s bedtime story nowadays. Before Elias Lönnrot wrote down this Finnish mythology in the 19th century it was being passed on to generations orally. It has contributed to our storytelling habits and written language, since there was barely any Finnish literature 150 years ago. Usually tales have been considered as an important way to pass on morals to community and children. Therefore each culture has their own kind of stories and heroes which affect the national identity. Back in high school my French teacher used to tell us how one’s mind works with the language one speaks. For example in Finnish we say I miss you ”Ikävä sinua” or ”Ikävöin sinua”. This could be translated more like ”I am yearning for you”. But when a French person says ”Tu me manque” they are actually saying you are missing from me. Languages have words that really don’t have a translation or the same kind of use. An example of this is a simple ”please”. Spaniards say ”por favor” which could be translated more ”to do a favour”. Asking for something without saying please can be considered rude in English and in Spanish. But us Finns, we don’t really say please. For us kind voice, eye contact and a thank you is enough to be polite. We have the translation to please as ”ole hyvä” which would be literally translated ”be good”, but it is used more to say you’re welcome. Or as Spaniards would say it’s nothing as ”de nada”. Every language has their unique words that can’t be translated with one word. This is typical for every language in the world. Finnish has many words for different kinds of snow whereas the language of Eskimos has even more. They are words that can’t be translated into English with one word, because English doesn’t have the same words for snow. This is simply because so many different words for snow haven’t been as significant in the native English speakers daily lives. Note that the language you speak as your mother tongue is usually the language you think in. Which leads to the fact that your mother tongue affects your personality, morals and customs. It can be a much more powerful tool to unite people together. Scientists have discovered that people who are bicultural and speak two languages may unconsciously change their personality when they switch languages. I bet many bicultural people can relate to this. So, to really know Finnish or any other culture it is useful to be aware of how our language affects our mindset, culture and daily lives. And then simply enjoy sauna. This text was written with passion. Comment or share to carry out discussion about the topic. What people know about Finland? Usually Aurora Borealis, Finnish sauna, Land of a Thousand Lakes, wild nature, real Santa Claus, sisu and Finnish design. I think it’s funny that there are many Finns who have never seen the real Santa Claus or Aurora Borealis. This is because many people from the southern parts of Finland doesn’t go to the Northern Finland on holidays. The more common choice for them is to go to the Canary Islands. Despite the previous, Finns are always proud to tell and boast about the little magic lights on the northern skies and they are seriously arguing that the Real Santa Claus comes from Finland. Seldom they do boast about having clean water, beautiful lakes or magical forests which they are more familiar than with Santa or the Northern lights. Nature is in some way an integral part of being a Finn. Of course the relationship between a Finn and the nature varies from Finn to Finn. Traditionally nature has played a major role in the Finnish society and in Finnish the way of life. In modern Finland, the relationship with nature has been loosening especially amongst those who live in cities. In Finland there are many people who love the silence of the nature. People tend to escape from cities to the countryside to have their own space, time and fresh air. There are many people who have their own summer cottage. Sauna is a must-have in summer cottages. People can purify their body and mind in sauna. If they are lucky, the summer cottage is situated near a lake, the Baltic sea or a river. In summer holiday they sort of move to their summer cottages and enjoy the life without stress and just enjoy the midnight sunsets, fishing and swimming. Cities are often quiet during the Midsummer, because Finns are enjoying the countryside – in Midsummer the silence, however, is found from the cities. Finns do appreciate their own personal space. 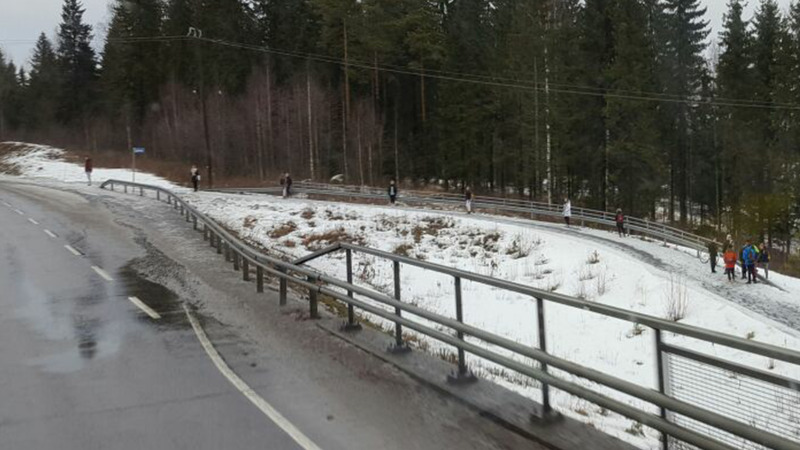 Good illustration of this is Finns waiting for a bus in a bus stop. It is not rare to see a situations pictured below. Finns won’t get too close to other Finns if there is room for maintaining one’s personal space – even if it requires standing in the rain. The preference of personal space can also be seen in coffee rooms and in celebrations. Finns tend to hold a coffee cup always with them, because then people can’t hug you and they need to stand clear to avoid spilling the coffee. Maybe that is why Finns do drink the most coffee per person in the world.